Quality policy We fulfill the quality that confidence and contentment of customers are got, and pursue the intermittent improvement of quality management system with observing the law. 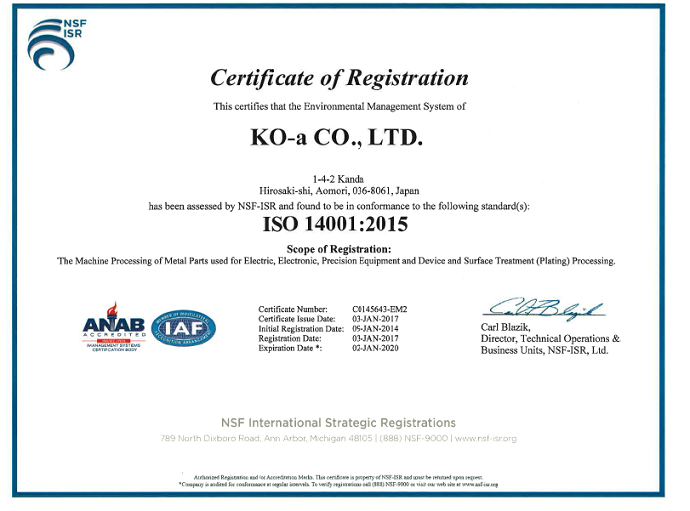 Date of Enactment: March 18th, 2016 ko-a Co. Ltd.
Environmental policy The basic philosophy We, ko-a Co. Ltd., recognize that global environmental conservation is one of the highest priority issue for everyone around the world, and make an effort to reduce an environmental load across the whole organization. Policies So as to reduce the environmental load created by our business activity (surface treatment, precision component manufacturing, and sales-and-marketing) and products, we promote the environmental management activity based on the following policies, and create a harmony with the global environmental. We observe the law (and the other requirements too) relating to environmental, and attempt to improve the environmental conservation. We carry out thorough the management of chemical substances that contained in product. We work on the improvement activity of effective use of energy, and promote resource conservation. We work on segregating wastes and reduce it by recycle, and promote the preferential buy of environmental friendly eco products. We must fully understand conducting our business activities under the beautiful environment blessed with nature and history of Tsugaru, and we contribute to create the community environment by such as cleaning up around the factory. So that each person can practice aggressively the environmental loading reduction activity, we shall inform all employees of this environmental declaration, and announce it to outside the company too. We participate aggressively in the environmental improvement activity of the community. For achieving the above policies, we set aims, regularly rethink it, work on intermittent improvement of environmental management system, and work for pollution prevention. 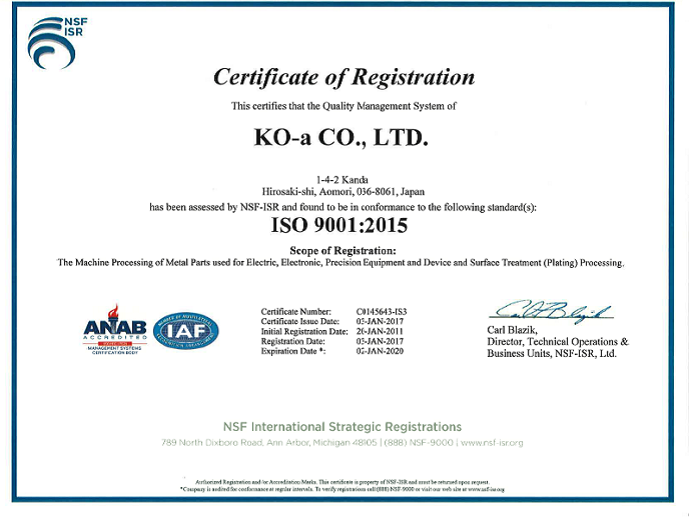 Copyright (c) ko-a Co. Ltd. All Rights Reserved.